What is the Resistor Guide? The Resistor Guide provides users with information on an extensive array of resistors, their uses and applications. Visitors to the site will find information to help them understand about the many resistors available, along with guides on selecting the right components for their projects. 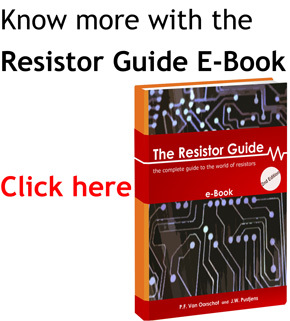 The Resistorguide is the most complete reference work on the net about resistors. Whether you just want to learn about resistor related topics, or need help in steps to make a good specification, the resistorguide will lead you through the process. Who developed the resistor guide and why? The site is developed by a dedicated group of mechanical and electrical engineers originating at the University of Technology Eindhoven. They started with the development because they noticed a distinct lack of quality technical information online. Utilizing their specialized knowledge and expertise, they launched the site to help others with an interest in electrical systems. The resulting Resistor Guide is an inclusive reference site for anyone engaged in electronic design and troubleshooting. The web version of the Resistor Guide is online since 2012. Resistor manufacturers, universities and other field experts are invited to submit articles for publication on Resistorguide.com. For the procedure, conditions and contact information, please read the guide to guest articles. Read How to submit guest articles.